It would be tough to find a first-round series in the Stanley Cup Playoffs that provides better contrasts than the Anaheim Ducks against the Nashville Predators. The Ducks have the NHL's top scorer during the regular season in Corey Perry, whose red-hot second half allowed him to reach the 50-goal plateau and win the Rocket Richard Trophy. They also have Teemu Selanne, who just continues to pile up 30-goal seasons even as he enters his fifth decade. Meanwhile, the Predators' leading scorer, Sergei Kostitsyn has 23 goals -- less than half Perry's total. However, the Predators don't need to light up the scoreboard when they have a world-class goalie like Pekka Rinne. The undisputed team MVP and likely Vezina Trophy candidate was runner up only to the Bruins' Tim Thomas in goals-against average and save percentage this season. On the other side, Jonas Hiller and Ray Emery have both dealt with ailments for the Ducks, which could leave Dan Ellis as the Game 1 starter. While the Ducks rely on a high-octane offense and the Predators a shutdown defense, they do have one thing in common -- each finished the regular season with 99 points. Anaheim has the edge in playoff experience, winning the Stanley Cup in 2007, while Nashville is still looking to win its first round in the postseason. Will the home-ice advantage Anaheim gained via tiebreaker (more non-shootout wins) prove decisive? Stay tuned. Anaheim's top line could be among the best trios in the League. 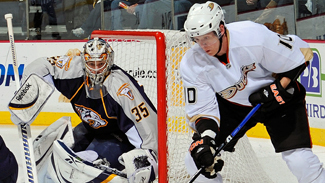 MVP candidate Corey Perry had a breakout season, leading the League in goals and finishing in the top five in scoring. Center Ryan Getzlaf is a premier set-up man, and Bobby Ryan and his 34 goals completes the trio. Their second line isn't too shabby, either, with Saku Koivu centering ageless Teemu Selanne and Jason Blake. Their bottom two lines, centered by veteran Todd Marchant and youngster Brandon McMillan, are about toughness, energy and checking. They won't supply much offense, but they can be tough on opponents. McMillan had 11 goals in his first NHL season and Jarkko Ruutu is a well-known irritant capable of getting the most talented players off their game. George Parros remains one of the toughest players in the League, and is capable of chipping in the odd goal. The Predators don't score a lot of goals, but they have six forwards with at least 16 -- and two guys (Martin Erat and David Legwand) missed 20 percent of the season with injuries. Mike Fisher was the big deadline addition and he has been anchoring a new-look top line with Patric Hornqvist and Sergei Kostitsyn. This group could get a boost from Steve Sullivan, who just returned from sports hernia surgery, and Cal O'Reilly, who is expected to be back during the playoffs. Nashville lacks a true game-breaker, but the Predators have some decent depth and don't be surprised if a young guy like Colin Wilson, Blake Geoffrion or Matt Halischuk is a surprise standout. Lubomir Visnovsky isn't a household name, but the Slovakian veteran had his best season, leading all defensemen in points while finishing a plus-18. Most importantly, he averaged 24:17 in ice time per game and had just 24 penalty minutes. His partner, Toni Lydman, also had a tremendous season, finishing second in the League with a plus-32 rating and 25 points. Rookie Cam Fowler stepped into the NHL at age 18, and while his minus-25 isn't attractive, his 40 points and 3 game-winning goals were more of an example of what his future holds. Andreas Lilja has had a solid bounce-back season after missing nearly a year with a concussion. Luca Sbisa and veteran Francois Beauchemin make for a strong third pairing. Nashville is young, deep and talented on the blue line. Shea Weber is one of the best all-around players at the position, and his partner Ryan Suter moved up another level this season and is approaching that territory. Cody Franson had a nice sophomore season and rookie Jonathan Blum hasn't looked out of place in his 23 games with the team. Toss in shot-blocker Kevin Klein and rugged Shane O'Brien and the Predators aren't a lot of fun to play against for opposing forwards. A real wild card could be Ryan Ellis if his junior team (Windsor of the OHL) were to lose. Ellis is a first-round pick and had 100 points in the regular season. Jonas Hiller was an All-Star in the first half and then disappeared for most of the second half, dealing with vertigo-like symptoms. Ray Emery was a revelation in his comeback from a career-threatening hip injury, but might not be 100 percent after sustaining an injury in the season’s final week. Dan Ellis was solid after arriving from Tampa Bay, giving the Ducks three viable options in goal. Pekka Rinne is likely to be a finalist for the Vezina Trophy and some pundits have pegged him as the deserved winner, though Boston's Tim Thomas is the favorite. Rinne was a workhorse for the Predators when he was healthy, and he might be the most indispensible player in the League. Yeah, he's pretty good and the Predators will be dangerous against any team as long as he's healthy. When the Ducks won just five of their first 12 games, many believed Randy Carlyle could lose his job. Anaheim then won six straight to start November and Carlyle kept the Ducks in the hunt despite major second-half injuries to Getzlaf and Hiller. Barry Trotz is one of the best coaches in the League, and even saying that he probably doesn't get enough credit for coaxing 90-plus points out of a budget-conscious franchise every season. That said, the Predators have never won a playoff series, and he's the only coach the franchise has ever had. Granted, they have never been higher than a No. 4 seed. One deep playoff run would cement Trotz as an undisputed elite coach and he could probably shed the underrated tag. Selanne is third in the League with 16 power-play goals, and Perry added 14. The Ducks' power play has scored multiple extra-man goals in seven of its last 16 games. The Ducks allowed at least one power-play goal in 16 of 29 games since the All-Star break. Considering they average the third-most penalty minutes per game in the West that could be a major problem. Nashville enters with the worst power-play unit among teams still playing (26th at 15.2 percent). The Predators do balance that out as a great penalty-killing team (fifth in the League), but squeezing out a few extra goals with the man advantage could be the difference between advancing or another early exit. Todd Marchant, Ducks -- A lower-line forward throughout much of his tenure in Anaheim, Marchant knows how to do all the little things that help a team win -- especially in a tight playoff series. A strong series from Marchant -- and his linemates -- can take some pressure off both the defense and whichever goalie gets the call for the Ducks. A bad series and the opponent’s top lines could run wild. Patric Hornqvist, Nashville -- Hornqvist reached 30 goals last year, but then was only able to play two games in the postseason. He didn't have the same regular season this year, but he's been hot of late (14 points in the last 11 games). Playing with Fisher might be just what he needed to find his 2009-10 form, and he could be the go-to scorer Nashville has lacked. Anaheim will win if … The Ducks play the same in-your-face, no-quarter game that was the hallmark of their run to the Stanley Cup four years ago. It also wouldn’t hurt if one of the goalies claims the job emphatically with a dominant run early in the playoffs. Nashville will win if... The Predators can get an early lead. They have an uncanny ability to shut things down when they establish a lead. Barry Trotz stresses defensive accountability and his stout collection of defensemen coupled with a world-class goalie in Rinne often makes it feel like the Predators are sucking the life out of a trailing team. NHL.com staff writers Adam Kimelman and Corey Masisak contributed to this report.